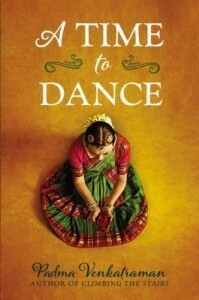 “A Time to Dance” (Paulsen/Penguin 2014) by Padma Venkatraman is an insightful story about a dancer and a novel- in-verse set in a different culture—of course I’m going to review it. Veda is a teenage Bharatanatyam dance student in India. At the onset, she is a competitive dancer who feels that “Pain is proof/ of my hard work,/ proof of my love for dance.” Veda feels the rhythm of the dance in every aspect of her life. When Paati, her beloved grandmother is “grating slivers of coconut for a tangy chutney,” Veda hears “thakka thakka thai” which is a perfect embodiment of the drum that accompanies Bharatanatyam dance. Ma wishes Veda would study to become an engineer or a doctor. Dance is not practical for a middle-class girl. But wise spiritual Paati supports Veda’s dancing. And Pa doesn’t mind. Shiva is the Hindi lord of Bharatanatyam and Veda’s hard-won trophy is made in His form. On the way home from the contest there is a terrible car accident. Veda loses her lower leg. Of course she is devastated. But now her true journey begins. Once she recovers from her initial depression and a young American doctor prepares her for and designs a special prosthesis, Veda is determined to dance again. She has a crush on the handsome doctor who took her through the worst of her ordeal. Once she recovers from his gentle rejection, she grows stronger. Veda’s first dance teacher will not teach the newly “disabled” girl. But dancer Dhanam akka sees her as “differently-abled.” Akka tells Veda she has extraordinary courage, but not enough compassion—allow yourself to feel loss. She assigns Veda to the young teacher, Govinda. He sees dance as meditation and says, “Meditation isn’t about pushing your body,/ it’s about respecting it,/ the way you’d respect every other space within which God dwells.” So, as Veda falls in love with Govinda (whose parents disapprove of his dancing and wishes he’d be an engineer), she learns to dance spiritually—with more depth and therefore more satisfaction. No matter your believe system, there is much profound wisdom in this well-told story and so much to learn from a culture outside the United States.